It was a familiar story. The pastor had left the church after a few years of, sadly, fairly inconsequential ministry. Did I know of anyone I could recommend to take his place? Probing further led to the comment that the problem with the previous pastor was that he tended to shut himself away in his study. At one level his sermons were excellent. People thought he was a good preacher. But somehow he was a ‘loner’ and there was something that didn’t connect with people. How does a preacher’s character affect his usefulness? It is perfectly possible for a man to love preaching but not love the people. Sometimes he may not even love Christ (John 21.15-17). Hence things come adrift in churches. I worry that some young men go to Bible college and think of proceeding into the pastorate almost as a substitute for an academic career. The delight of the theological nerd is to do with having the time to spend hours with fascinating books, and in coffee-sustained solitude to pore over the Puritans or the latest commentaries. He will then write a little essay on his findings and showcase it on Sunday morning to a captive audience. Unsupervised privacy for weekdays plus the celebrity of public ministry on Sundays is for him an ideal combination for job satisfaction. But congregations need to hear the truth in love (Ephesians 4.15). A Mr. Great-heart is in the pulpit not because preaching is a vehicle for his ego or research interests, but because he loves his flock and longs to do them good. A sermon series is not chosen simply because there is some new monograph out on some book of Scripture which happens to have tickled the preacher’s scholarly fancy, but because, through his continual contact with the people, he is conversant with their spiritual needs, and so leads them into a part of God’s word that addresses their condition. Even great men can be too detached. Mike Reeves of UCCF mentioned recently that perhaps some of the troubles which the great Jonathan Edwards encountered at Northampton might have been avoided if he had spent less time in the study and more time with people. This leads us to another consideration. It is true that the preacher must convey Bible truth and major on Christ rather than drawing attention to himself. Nevertheless, Phillips Brooks had a point when he spoke of preaching as ‘truth through personality’. True preaching involves the man as well as the message. Bible colleges and training courses must avoid turning out preaching clones who are in such a straightjacket of exegetical method plus formulated application that nothing of who they are in Christ comes through. Biblically, truth is more than just a set of propositions. God’s truth is a living entity which is meant to shape our lives. Therefore something of how the truth has affected the preacher himself ought to be evident. After all, if the truth has not changed him, how can his hearers get excited about what he is saying? The man clothes the message. Dr. Lloyd-Jones was rightly able to say: ‘Preaching is theology coming through a man who is on fire’. It is worth counting how often Paul mentions his own Christian experience in his letters. This is not attention seeking. Rather it is personal testimony that the truth works. At the funeral of a friend recently, her brother said that Hilary loved the truth but she wanted more than mere propositions from a preacher; she wanted to see a tear in his eye as a mark that the truth had affected him. This article was first published in the August 2012 issue of Evangelicals Now. For more news, artciles or reviews, subscribe to EN or contact us for more information. In the late summer of 2011 Esther was diagnosed with bone cancer. She was only 12 years old and had just over one year to live. She died in December 2012. But she died in Christ and ‘her hope in God was incredible’, says her sister Miriam. But, through what happened in August 2011, God stepped into Esther’s life. Esther explained: ‘I remember going to St. Ann’s Hospital for an X-ray. I had been getting bad pain in my right leg and I wasn’t able to sleep. I was sent to North Middlesex Hospital for more scans and, shortly after having a biopsy, I was diagnosed with bone cancer’. This came as a great shock to Esther and everyone around her. It had been thought that the problem was simply down to some severe growing pains. Over the next year or so Esther had six different types of chemotherapy, two operations to remove tumours, radiotherapy and an operation to give her a metal knee. But none of these treatments worked and the cancer eventually spread to her lungs. 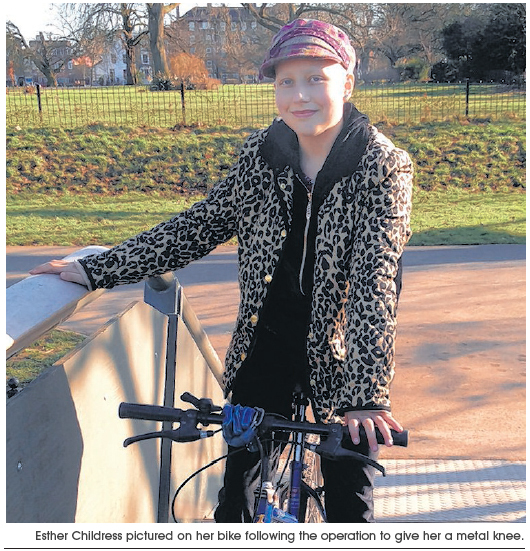 ‘It was hard going to hospital and keep hearing bad news’, said Esther. This practical kindness reminds us of the apostle Paul’s words concerning the nature of genuine Christianity: ‘The only thing that counts is faith expressing itself through love’ (Galatians 5.6). She concluded: ‘I’m so grateful that God has given me 13 years of life, loving parents who have supported me, friends and family who have continued praying for me and, most importantly, his Son Jesus Christ, who died for me’. Esther lived to see her 14th birthday on December 3 last year and went to be with the Lord on December 27 at her home in Tottenham. The Music Exchange from Richard Simpkin: Love that drummer! I’ve had a go when no one was looking, but I can’t play the drums. I have no rhythm and no co-ordination between my feet and arms, which may seem strange as I was trained as an organist. Hmmm, maybe I’m not a very good organist either, but everyone’s been too nice to tell me. If you hate drums, don’t read on! I’m not going to go into all the arguments about why we should or shouldn’t have drums in church. This won’t be a theological defence or prosecution dealing with whether drums are evil because of their origins or vital for the Spirit to be able to work. That’s for another day. Suffice to say that if you really hate drums, please don’t read on — it’ll save me having to answer all the mail. 1. They have to play well, sensitively, rhythmically, focusing on the words of the songs, using different sticks for different parts of songs, listening to the rest of the band, linking in the bass drum with bass guitar, doing what the band-leader requires while at the same time being in control of the speed and rhythm. I have a friend who says that drummers hardly ever smile. That’s probably because they have so much to concentrate on at one moment. I must admit to not smiling much playing a Bach trio sonata on the organ. Bass players don’t smile either, but that’s just because bass players don’t smile. 2. Drummers can’t win. Sometimes they lose even before they’ve played a beat — even the sight of a drummer sitting on the drum stool before a meeting can give some people the heebie jeebies. The doubly hard thing for drummers is that even if they ‘make’ the music for those who like drums, they break it for those who don’t. I think it’s for this reason that many of the drummers that I know are also some of the most humble in a band, because they’ve had to deal with some of the most hurtful feedback. There are lots of issues that surround drummers. Should they be miked up, should they be behind a Perspexª screen, should they be out of sight (that’s invisible, not ‘outa sight’), should they play for some of the older hymns, should they have mats on the toms, should they use cool rods, hot rods or sticks? I remember a drummer’s eyes lighting up when I asked him to use sticks at a wedding. He’d always had to play with soft rods and brushes. 3. Drummers have their own language that I sort of understand, but am not cool enough to use. Rim shots, fills, four-on-the-floor, ride, hat. I find myself always reverting to: ‘Can you give us some rumble, then a bit of boink, der-dum, karrang, doink into the chorus, and then a bit of blobbles for verse 2. Then we need it large for verse 3 into the chorus’. Not much to say on this except that I wish I was a bit more cool. All this and much more gives me huge respect for drummers. In my experience most of the rehearsal is spent getting the drums right — speed, feel of the song, keeping the song going, starting and, most tricky of all, finishing the song. For this reason, if I feel safe with the drummer, I have much more confidence that things won’t fall apart. That’s very important for the confidence of the congregation too. Praise God for servant-hearted, godly drummers. P.S. One final tip for working with drummers. If they tell you they don’t like playing a song in 3/4, ask them to play it in 6/8 and see the relief on their face. This article was first published in the July 2012 issue of Evangelicals Now. For more news, artciles or reviews, subscribe to EN or contact us for more information. Can you do a little mental arithmetic? Assuming you live to your early 60s, how many hours will you have spent at work? Now, do a similar exercise. Think about how many hours each week you spend on overtly ‘Christian’ activities, time at church in worship, at Bible study and in prayer groups, time at leadership meetings, teaching kids, or working with youth. If you were to work 50 hours each week, then you would have spent about 100,000 hours at work by the end of your working life. If you were to spend (say) an average of ten hours a week in ‘Christian ministry’, then, over that same 40-year period, you would have spent 20,000 hours. 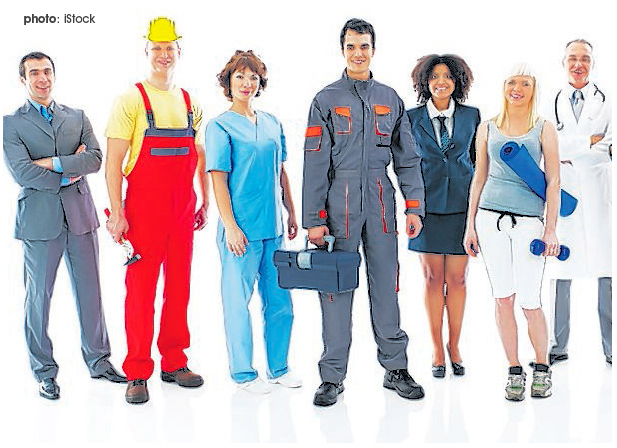 In summary: 100,000 hours at work; one fifth of that time in so called ‘Christian work’. Park those numbers for a moment and consider the words of the apostle Paul: ‘Therefore my dear brothers let nothing move you. Always give yourself fully to the work of the Lord, because you know that your labour in the Lord is not in vain’ (1 Corinthians 15.58). What is meant here by ‘the work of the Lord’? What is the ‘labour in the Lord’ that is not ‘in vain’? Does that refer to overtly ‘Christian work’? Many would say yes. Paul means the work of evangelism, discipling and building churches. But, if that were true, then for those of us who have day jobs in the secular world, what about the 100,000 hours we spend at work? Do they represent some sort of spiritual limbo land, just an infill between Sundays, a means of supporting our families, a necessary evil? In terms of value, is it all a second-best use of time for the Christian or, worse still, something ultimately meaningless, of no eternal value, time and effort spent in vain? The Bible’s answer to those questions is a resounding no! Paul says: ‘Always give yourself to the work of the Lord’. Note the word ‘always’! That includes the 100,000 hours at work, not just the 20,000 hours spent in ‘Christian service’. But how can I work for the Lord when I am paid to make money for my business, or to serve the good of the public in government? If I need to concentrate 100% on the technical detail of my task, or on the people I am paid to help, then how can I be working for the Lord at the same time? What meaning does my work have in the context of eternity? The equipment I repair, the report I write, the structures I build, the meetings I attend, what value do they have in God’s eyes? These issues are not always addressed in our churches. When I first became a Christian, the only sermons I ever heard about work were along the lines of ‘don’t fiddle your expense accounts and tax returns and don’t steal pencils form the office’! While some churches may not seem to have daily work on their priority list, God certainly does. The Bible makes very clear that our daily work is of great interest to him. It does have eternal significance, and it certainly does not have to be ‘in vain’. So, what transforms our daily work into meaningful spiritual activity? The answer of the Bible is twofold. Firstly, it is because of why we do our work (our motives), and, secondly, how we do our work. ‘Whatever you do, work at it with all your heart, as working for the Lord, not for men. Since you know that you will receive an inheritance from the Lord as a reward. It is the Lord Christ you are serving’ (Colossians 3.23,24, NIV). Notice that three times Paul underlines the same crucial point: ‘working for the Lord’; ‘you will receive an inheritance from him’ (note that our daily work leads to eternal reward); and ‘it is the LORD Christ you are serving’. Notice also the same all- encompassing scope of this command: ‘Whatever you do’; an interesting tie-in with the ‘always’ of 1 Corinthians 15.58. * It means seeing my job as a calling from God, not just a career that meets my personal goals. We are not to waste hours wondering what our calling is. Surely we are to get on with our job and serve the Lord where we are! If he wants us to do something else he will make that very clear in his time. Seeing our work as a calling is transformational. * It means being accountable to God. I make it my aim to please him. I can’t please everybody, so if I work to please Christ it simplifies life a lot. * It means we give it our best in terms of ideas, energy, and creativity. * It means our primary motivation is not to earn money and accumulate wealth, not to promote our own prestige and boost our own ego. Rather, it is to serve God in and through our daily work. In the same letter, Paul urges us: ‘Whatever you do, whether in word or deed, do it all in the Name of the Lord Jesus’ (Colossians 3.17). Notice again the reference to all our activity, the secular and the spiritual. To do our work ‘in his name’ means being consistent with his character and bringing honour to the Name of Christ. It means we work honestly, faithfully and with integrity; it also means that we aim to build quality relationships. Most of the sermons, books and articles about work seem to me to be focused on either ethics or evangelism, but I’ve found that building relationships with people is often the biggest test for the Christian. After all, the Bible makes clear (e.g. 1 John) that we are fooling ourselves if we think we can have a good relationship with God when we can’t build relationships with other people. Relationships at work raise many challenges for us: how we exercise authority; how we respond to authority; how we handle conflict. In these areas our professed faith is tested every day. But, every time we face a work situation where we seek to respond in a way that honours the name of Jesus, then our work is sanctified by the Word of God and prayer. In becoming an act of service to the Lord himself, it becomes something of eternal significance, part of our worship of God and not ‘in vain’. But our work is of eternal significance not only because of what we do, why we do it and how we do it — there is a bigger picture — it is of eternal significance because of what God is doing. He is at work also. He is at work in us. As our commitment to do our work for the Lord is tested, so we learn to rely on God and so we grow. At work we have to deal with long hours, pressure, difficult people, difficult customers, failure when things don’t turn out well. It is in the pressure cooker of work, in the rough and tumble of life, that God moulds us into the people he wants us to be. it is in those 100,000 hours (as well as in the home, of course) that much of God’s work of sanctifying us takes place, a work that is of eternal value. He may also be at work in the lives of those we work with and that is always exciting to experience. Further, he may choose to work through us in bringing someone to faith or helping them along the road in some way. When our work is ‘for the Lord’ and when we recognise God at work in and through us, and in the lives of others, then we can be confident that our labour is in fact ‘labour in the Lord’. It has a divine purpose and will have a fruitful outcome. It will not be ‘in vain’. (This article was first published in the May 2013 issue of Evangelicals Now. For more news, artciles or reviews, subscribe to EN or contact us for more information. I grew up in a boarding school. My father was a boarding school house master, and we lived on the grounds of this community. I did not grow up in a manse or vicarage or parsonage. My children, of course, are growing up ‘Pastor’s Kids’ (PKs). How can I help them flourish in that environment? As I write, America is shocked and saddened to hear of the suicide of Matthew Warren, the son of well known megachurch pastor Rick Warren. I know Warren only by reputation, but, as I read his email describing the tragedy, I was struck by his remarkably compassionate and wise response. My heart went out to him as a father and I immediately tweeted: ‘Praying for Rick Warren and family’. Since then there have been several attacks launched against the Warrens, slurs and innuendos, and my heart is grieved again. Can you not give the man and his family some peace? Mark Driscoll blogged a fiery response to these critics, defending Rick Warren against such attacks. How will they turn out? It is also making me ask myself a wider and more personal question: how can I — as a father of four children — do all that I can to ensure that their experience growing up as ‘PKs’ is not only positive, generally speaking, but a place of spiritual, physical, emotional and cultural thriving? I hesitate to give any advice at this stage of our lives — our eldest is 12 and our youngest is one — as I may have to eat my words in 20 years’ time. I am trying certain things, but who knows how they will turn out? But, for what it is worth, I pass along my thoughts in five bullet point suggestions and would be interested if readers have any additional comments along the same lines. * Actually care. I can fail to express my care for my children, I can fail to give them the time they should receive, but, as one elder at College Church said to me recently, children know when they are actually being loved. That love may or may not be exactly what they want, but if you love them, care for them, even if you fail to express it perfectly, likely as not they will realise they are being loved — and will love you for it, long-term, even if they think you are about as trendy as a goat on roller skates. * Give time. I hate to confess it, but this is probably where I struggle most. I work hard. I always have. Too hard, no doubt. But time is short and I have a mission and I’m scared to death I won’t get it done before I die. But, part of that mission is being a dad. And being a dad means: time. Unstructured time. ‘Wasted’ time, ‘unproductive’ time. * Find individual and specific ways to spend time with each of the children (if you have more than one). Now I have four, and I am astonished how different each of them is. Their ‘love language’ (to use Chapman’s phrase) is different for each of them, and finding a way to express that care in that specific way for each of them is critical, it seems to me. If there is an overlap between things I like and things he/she likes, all the better. That overlap space seems to create relational glue. * Do everything I can to avoid the children overhearing the Current Report About Problems at the church. I have a sneaking suspicion that anyone much younger than 30, and with considerable spiritual maturity, is too young/fragile to hear about the underbelly of church politics, failures and general nastiness. I love the church, and most of it is great. But you know what I mean. Children cannot hear about this stuff. * Spend personal devotional time with each child. Everyone has different theories about how to do this, but here’s mine: I think that if a parent can personally sit down, intimately, personally, with the Bible and with a child, then the chances of the Word digging into that deep mother-father, soul space is much increased. Those are a few thoughts. But most of all pray for the Warrens — who no doubt have a better answer to all of this than I do, or ever will. Over 800 students each day in February heard compelling presentations of the Christian faith. Richard Cunningham (Director of UCCF: The Christian Unions) spoke at the university mission in my first year as an undergraduate in Cambridge 17 years ago, and the student evangelism bug that I caught back then hasn’t left me. 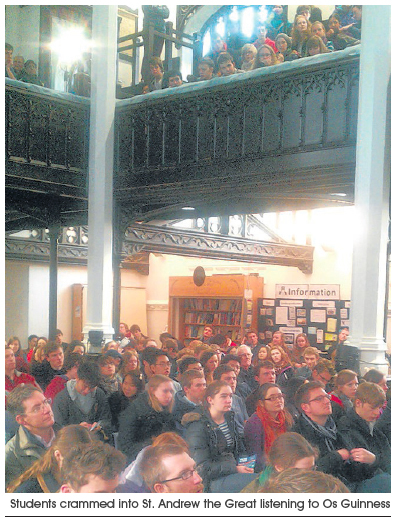 So it was especially thrilling to see him welcomed back by the Cambridge Inter-Collegiate Christian Union (CICCU) to speak at their ‘What Kind of God?’ mission event from February 4-8, alongside Os Guinness (respected author and social critic). As with many Christian Unions around the country, the university was introduced to the mission speaker, before Christmas, when nearly 2,000 students heard Richard speak across the two CICCU Carol services at Great St. Mary’s Church. A specially commissioned Cambridge edition of John’s Gospel and an invitation to the mission events were produced for every undergraduate in each of the Cambridge colleges. All of this — undergirded by many months of prayer and planning — focussed attention on the launch of the CICCU triennial mission. Over the course of five days, in St. Andrew the Great Church in the heart of Cambridge, Os Guinness gave apologetics talks (with Q&A) at lunchtimes, and Richard Cunningham gave evangelistic expositions from John’s Gospel in the evenings. Furthermore, each night the events were enriched with live music from a stunning jazz trio lead by Bill Edgar (professor of apologetics at Westminster Theological Seminary and world class jazz pianist), with Ruth Naomi Floyd (vocals) and Randy Pendleton (bass). The first evening saw the trio take centre stage with a longer sequence of heart-rending songs interspersed by brief explanations from Bill as to the gospel roots of jazz. The climax was a powerful talk by Richard, continuing the theme of slavery and freedom. Graham Shearer (UCCF Team Leader for Central region) commented on this more holistic approach to the mission: ‘The Main Event was shaped by a desire to address students as whole, integrated people, just like Jesus does in the Gospels. Os Guinness’s talks dealt with the most profound questions human beings can ask; Richard demonstrated from John’s Gospel that only Jesus meets our deepest longings and most pressing needs. The inclusion of high-quality jazz from Bill Edgar and his musicians came right under the guard and touched students in a deep and profound way’. What was so distinctive about the lunch-time apologetics talks was the modesty of their aim. Os was committed to slowing the conversation down, working hard to take each student with him, and encouraging his listeners to take the next step in their quest for Truth. The vast majority of today’s students are a country mile away from a Christian worldview, meaning that just getting someone to stop and ask some of life’s big questions is a cause for celebration. And so, like an experienced rugby player, rather than attempting to score an unlikely try whenever he got the ball, Os’s primary concern was simply to advance the game line. Over the course of the week, more and more ground was gained, as students were urged to make ‘Time for Questions’, ‘Time for Answers’, ‘Time for Evidences’ and ‘Time for Choices’. As Socrates famously said: ‘The unexamined life is not worth living’. It was wonderful even to hear that unbelieving students were inviting their own unbelieving friends to join the discussion! Students from at least nine different churches in Cambridge were involved in the mission, with many of these churches participating in the project in all sorts of ways: hosting, planning, sending people to give training seminars at the pre-term CICCU house party, changing their weekly schedule to accommodate the week, running evangelism training days in their churches, sending people to assist as CU guests and organising additional follow-up courses! Russell Winfield (senior student pastor at Holy Trinity Church) observed: ‘This year’s mission was a wonderful event from beginning to end. Many students were able to invite their friends to consider the claims of Christianity, as both Os and Richard expounded the truth in compelling ways, sparking conversations that otherwise may not have happened. Students working together from many different churches is proving to be a fantastic witness to the message of Jesus Christ’. Alasdair Paine (vicar of St. Andrew the Great Church) added: ‘Praise God for the CICCU, with students working so hard for their friends to hear the gospel.’ These are indeed exciting days. Please pray on! Dave Gobbett is the Associate Pastor at Eden Baptist Church and was CICCU President 1997-98. How has this helped you as you teach God’s word?